Do you know how much your business spends on print-related costs? For many Southern California businesses, printing can account for as much as 2-3% of their expense budget, and this doesn't even include the productivity that can be lost due to copier and printer breakdown and workflow inefficiencies..
At Advanced Office, we specialize in helping our Costa Mesa clients develop print and workflow solutions that will reduce their printing costs and increase their productivity. We have more than 30 years of industry experience and have provided our solutions to over 30,000 businesses throughout Orange County, Los Angeles, San Diego, and Riverside. Our copier and printer experts are factory trained and average over 10 years of experience. By providing a comprehensive worksite analysis, they can make office equipment and software recommendations that are tailored to the unique needs of each of our clients. With our local, responsive, and highly trained customer service representatives, your Costa Mesa business can obtain the reliable and personalized service that you expect from your copier provider. 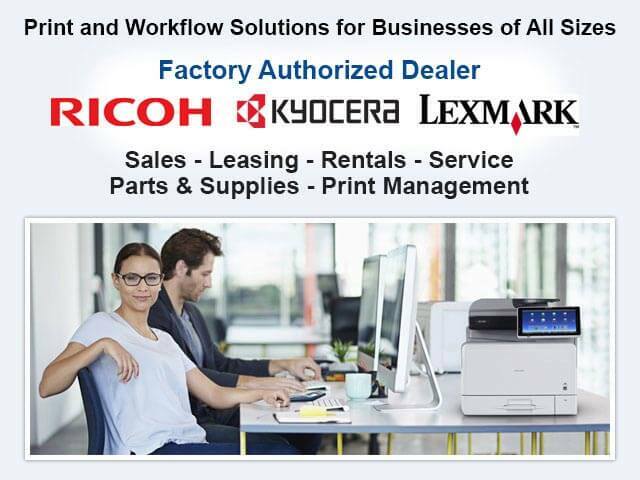 In fact, it is because of our superior service, competitive rates, and innovative workflow solutions that Advanced Office has become the leading Ricoh dealer in the Western Region and attained Lexmark's highest level of dealership as an Authorized Lexmark Business Solutions Dealer. Call today to schedule your free onsite analysis. We're open Monday through Friday, from 8am to 5pm. 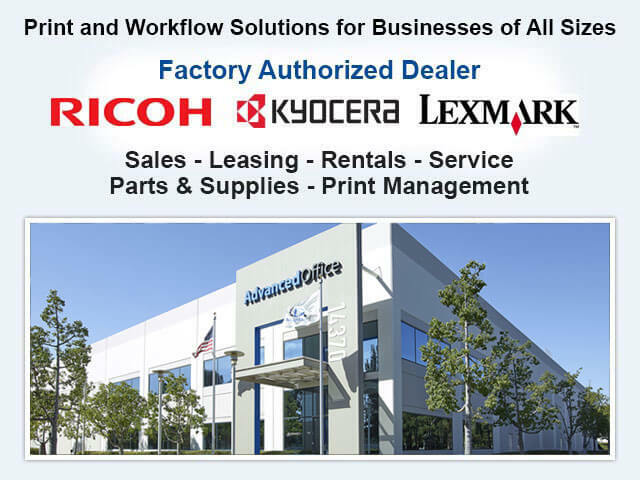 Advanced Office is proud to be an independent authorized Ricoh and Lexmark dealer serving the Costa Mesa area for over three decades. Because we are an authorized Ricoh and Lexmark dealer, you can trust that the members of our sales team are experts in all Ricoh and Lexmark machines and our technicians are all manufacturer trained and certified. 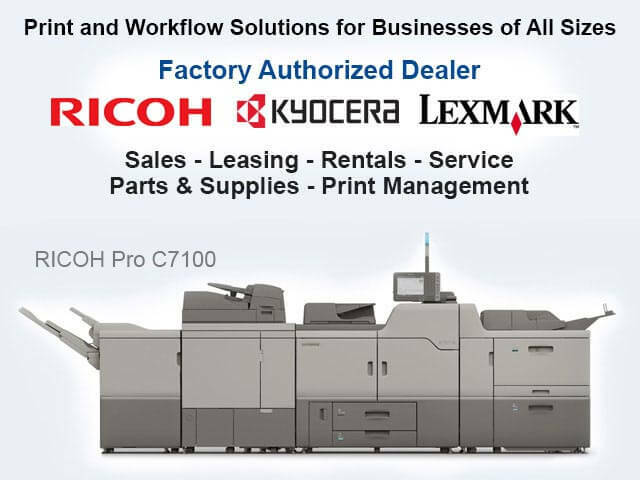 Additionally, because we are among Ricoh and Lexmark's top dealers in the nation, we not only offer our clients the industry's best printers and copiers at the most competitive rates, but also provide them with access to special pricing and inventory. Call us today to schedule a free consultation. When considering a commercial copier, printer, digital duplicator, wide-format printer, production printer, or fax machine purchase, we know that you want the right machine to meet your needs at the best possible price. At Advanced Office, our office automation experts have years of experience and training to accurately analyze the print-related needs of Costa Mesa businesses of any size and from any industry. They consider your existing equipment, the needs of your key users, your current and future print-related needs, and your overall workflow, before making any product recommendations. We sell and install Ricoh and Lexmark copiers, printers, digital duplicators, production printers, wide-format printers, and fax machines because we believe they offer the best return on investment. Their machines are fast, reliable, cost-effective, and eco-friendly. They feature high-quality components, a variety of finishing options, and the capacity to be fully customized. By working with us, we'll give you honest recommendations on which machines will be best suited for your Costa Mesa office..
Our refurbished copiers make it possible for our Costa Mesa clients to get a like-new copier for a fraction of the price of a new one. Our certified refurbished copiers consist of lightly used Ricoh and Lexmark multifunction copiers that have come off our short-term leases. Our trained technicians strip and clean these copiers; replace all high-wear components; and perform a 60-point inspection. Once the inspection is complete, these machines are qualified for resale and service on our all-inclusive contract. Call today to discover what we have in stock--our inventory changes daily. 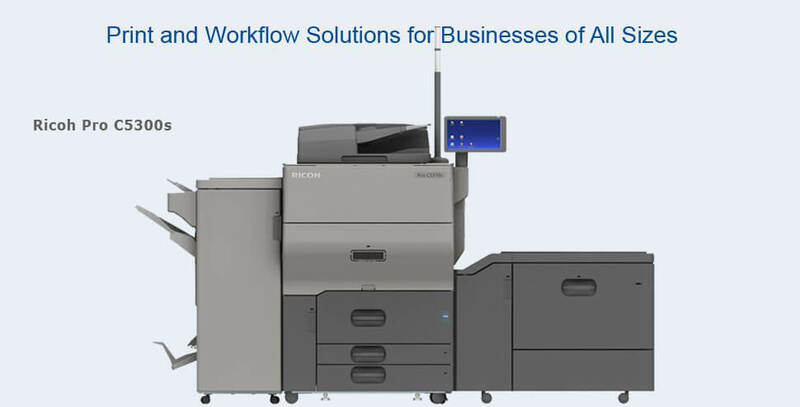 Advanced Office makes it possible for Costa Mesa businesses to afford Ricoh and Lexmark's exceptional line of copiers, printers and other office equipment. We offer 36 to 60 month leases with low monthly rates, no money down necessary. Our leases can be used to finance one large machine or a fleet of copiers and printers, as well as a service contract and custom software. Call today to learn more about leasing a copier or printer in Costa Mesa; you can speak with our highly experienced sales consultants or our in-house lease advisors for specific financial and accounting information. For Costa Mesa businesses in need of a multifunction copier for a period less than two years, we offer affordable rentals. We specialize in renting Ricoh and Lexmark's commercial-grade printers and copiers for short terms (as little as a day) and long terms (up to two years). As with all our services, we offer cost-effective pricing, expert consultations and support, and unbeatable personalized service. 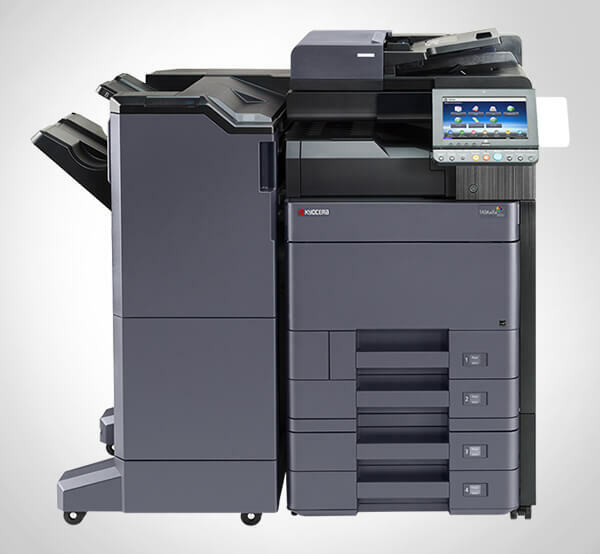 Call us today for a free estimate on your copier/printer rental in Costa Mesa. Advanced Office provides businesses across Costa Mesa with exceptional maintenance, service, and repairs for Ricoh and Lexmark copiers, printers, production printers, digital duplicators, wide-format printers, and fax machines. These services are primarily offered through our cost-effective, all-inclusive service and supply contracts, which include service, maintenance, repairs, on-site product training, access to our technical help desk, high-quality parts, toners, and more. We also offer standard parts and labor contracts for those with smaller printers that don't need the cost of toner included in their service package. Regardless of which contract you choose, you'll benefit from exceptional and responsive service from our factory trained and certified technicians who average nearly 13 years of experience and excel at first-call effectiveness. Call today to learn more. 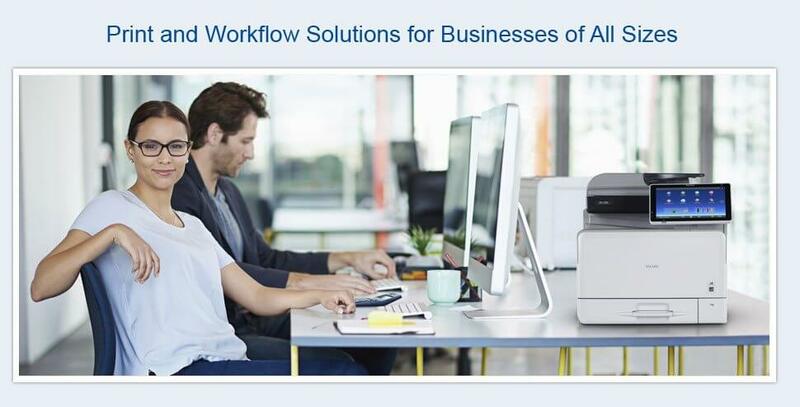 Businesses in Costa Mesa can improve and possibly eliminate workflow inefficiencies by taking advantage of the latest advances in software for copiers, printers and other office equipment. With our customized software-based solutions, you can leverage your existing infrastructure, accelerate key business processes, reduce storage costs, improve document accessibility, and more. Our state-of-the-art software integrates seamlessly with Ricoh and Lexmark's copiers and printers, but can be designed for any brand of office equipment, including Panasonic, HP, Sharp, Xerox, and Canon. If you would like to learn more about our software solutions, call us today for a free workflow analysis; we'll determine which software solution will best meet your needs and fit your budget. Your professionalism and prompt reply made our selection for our new copy machines an easy process. The staff has stated to me how much they have enjoyed the new Ricoh 4500 and the 5500 copy machines. . . .